1. Preheat oven to 350ºF. Coat a 9-inch baking pan with cooking spray. In a large bowl combine the flours, ground ginger, ground cinnamon, ground cloves, baking soda and salt. 2. In another bowl, combine the Splenda with the buttermilk, applesauce, molasses, oil, egg, crystallized ginger and fresh ginger. 3. Slowly stir in the flour mixture and mix to combine with a wire whisk. 4. Pour the batter into the prepared pan and bake for 25 minutes, or until a tester comes out clean. Cool in the pan until cool enough to cut without producing crumbs. 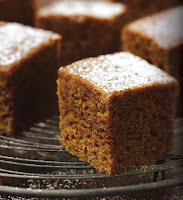 Sprinkle with powdered sugar and cut into squares. I've made this recipe twice last week (yes, they are THAT good) and both times I did not have any fresh ginger. They were still awesome. When I had a culinary friend of mine try them, he gave a definite nod of approval - his only comment, the grated ginger would be a nice texture throughout. So, this week when I make another batch the fresh ginger is being included. These little gems stay moist even after a few days thanks to the applesauce and buttermilk. It wasn't until recently that I learned that Splenda will dry out baked goods if not eaten within one to two days after being made. Now, whatever servings are left after the first day are placed in the freezer. You really don't need the powdered sugar, though it adds that extra touch when served. So for me, decreasing the grams of sugar per serving? Heck yeah!